Angela has loved playing sport all her life and grew up with a supportive family taking her to endless football (soccer) and tennis training + representative tournaments. She also played touch football, netball and swimming. Being active all her life led her to pursue a career in the health and fitness industry. As Angela was studying at university, her love for strength training increased and she secured her first job as a gym floor supervisor and personal trainer at Regenesis Fitness (yes, that’s right, she is an old face!) During her final year of her Bachelor Degree in Human Movement, she went under numerous investigations to identify the cause of irregular heart rhythms. She finished her degree and in December 2013, 2 weeks before her 21st birthday, Angela was diagnosed with a heart condition – arrythmogenic right ventricular cardiomyopathy, and she now lives with an implantable cardioverter defibrillator. Two months after these surgeries, whilst Angela was still under-going cardiac rehabilitation, she soldiered on and started her Masters in Exercise Physiology. It was at this point of time that not only her own life had changed, but she knew that she wanted to have a big impact on the health of others too. Whilst continuing studying, Angela left Regenesis to pursue an opportunity to open her own franchise of an outdoor women’s training company – She Fitness. Angela now owns 5 franchises. After finishing her Masters degree, she secured a great role at Scolicare – specialising in Exercise rehabilitation for Scoliosis and back conditions. As time has gone on, Angela has learnt to use her own personal experience as a motivator and encouragement for others dealing with a health issue. It has been a physical and mental battle to continue to learn to push within her own limits due to her heart condition but this has enabled her to better teach the same principles to her own clients. 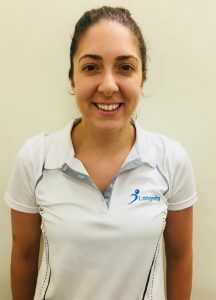 With over 5 years experience in the industry as well as having these special attributes, Angela now joins us at Longevity Personal Training and Exercise Physiology to help have a greater impact and promote Longevity amongst our community.